Pembroke Pines Movers – Moving is never easy, but it doesn’t have to be stressful. With the right partner a move can run smoothly and hassle free. 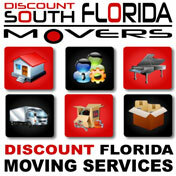 Discount South Florida Movers has been in business for many years helping people all over South Florida. Our rates are the best in the area and our service is second to none. Come request a free quote today. There is a lot that needs to be planned and prepared even before the day of the move. The experts at Discount South Florida Movers can guide you through the process. We can also help you prepare by securely packing your belongings, and even pack and transport fragile items such as a piano or artwork. No matter what you need done for your residential or business move, we can help. Pembroke Pines is the second largest city in Broward County, with a population of 155,000 it is also the 11hth most populous city in Florida. The city was originally incorporated as a village in 1960 after being settled in the 1950s. The city experienced tremendous population growth after Hurricane Andrew when many people moved out of Miami County. Six different Universities have campuses in the city including Barry University, Broward College, and Florida International University. It also the current home of Hall of Fame linebacker Lawrence Taylor. Despite having half a dozen hurricanes run through the city in the last 20 years, very little damage has been done to the city overall and what damage was done has since been repaired. Discount South Florida and Pembroke Pines movers provide low rates on residential, commercial, piano and long distance moving.